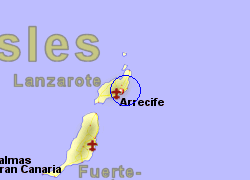 Map of the Arrecife Ferry Port area. 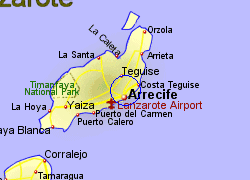 The Ferry port at Arrecife, the capital of Lanzarote lies approximately 2km east of the old city and 9 km east of the airport, on the Canary Island's eastern coast. The old natural harbour (closer to the city and used by smaller boats) has been in use since the early 1400's. 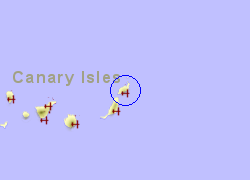 The port and city are connected to the north of the island by the LZ-1 motorway, and to the south via the LZ-2 motorway, the 35Km trip to Playa Blanca taking around 40 minutes. A bus service runs between Arrecife and Playa Blanca every hour during the day (less frequently at week ends) with a journey time of just under an hour. Operated by Acciona with upto 4 crossings per week, crossing time 8 1/2 hrs.